Surprise and relief was my response to Martina’s chat, with two youngsters from the Living & Learning project, about growing up in a favela. Sometimes the day to day normality of favela life is lost in the media focus on violence. It is also important to bear in mind that the level of law and order in the favelas varies from area to area and one account does not depict all favelas. This is Djalma and Jorge. Best friends. Ordinary teenagers entering into adulthood full of dreams and plans. With just one difference – they were brought up in a favela. And how they feel now? I wondered if they wanted to continue living in a favela. 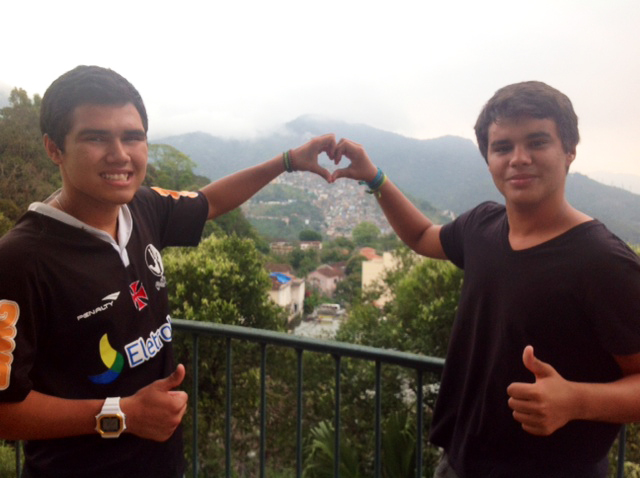 “I never want to leave my favela” says Jorge “I wouldn’t find such freedom, friendship and closeness anywhere else. So I always thought that even if I get rich, I always want to stay close to my favela, and maybe have a house nearby. I have never ever thought about leaving my community. It has its problems but I still think it is the best place to live. And after all, you don’t get better views that from up on the hill!” “It was the best childhood you could wish for, Martina, within our community! I wouldn’t change it for anything!” Djalma assures me. This is an article to ponder and re-ponder! Yikes! What counts as “better”? Who are the men to be feared? And yet again the notion of community and the strength of such communities… their wobbles – yes – and definitely their wonders….. Are the “benefits” though realised at the time – or do they reveal themselves only with hindsight when they have disappeared? I do not know…. I feel I have seen a grain of sand in a vast sandy desert…… But that grain! Wow – it is always fascinating seeing and hearing different perspectives on life and in this instance, life in one favela. What comes across very strongly in this interview is that the boys have a real connection with their community. It reminds me of one Indigenous understanding of poverty: ‘You are poor when you are disconnected from God, disconnected from community and when you don’t have enough to share’. It would seem that the boys are well connected to their community and they do have enough to share – not sure about the first one.. but it would seem that the boys are living testament to the indigenous view of poverty – that poverty cannot be defined in purely material ways.